And for FolioPress Pro click on Upload Theme button at the top. FolioPress Pro then click on Install Now and activate it. Download the FolioPress/FolioPress Pro theme. Unzip foliopress.zip to your desktop. Upload FolioPress/FolioPress Pro theme to /wp-content/themes/. 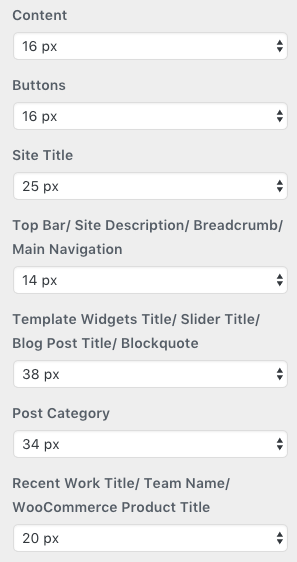 From this option you can set post layout (Blog) to List or Grid. You can Show Featured Image on Page/Single Post with height adjust, Set Post Grid Column, Post Grid Height, Post Grid Gutter and also set Post Grid Fluid. From this option you can hide the search icon from the navigation of the header. From this option you can stick the navigation bar at the top. 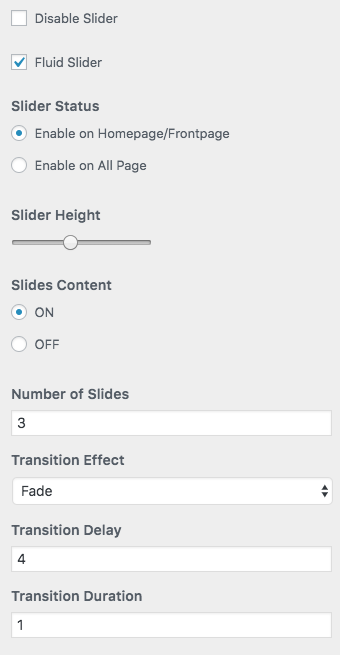 You can Fluid Slider, show the Slider Status to Homepage/Frontpage or All Pages, adjust Slider Height, ON/OFF Slider Content, set Number of Slides, Transitions Effect/Delay/Duration. 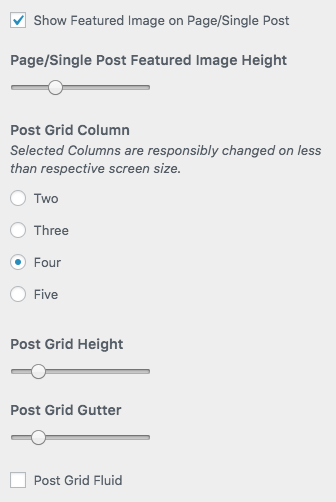 From this options you can select the Slider Type and set the Slide. From this option you can set the slider via post/page ID. Now just Add the Post/Page ID. If you need more slide for slider just go back to Slider Settings where you can see Number of Slides option to enter the number that you need to slide then click on plubish button and refresh the page. Now you can see more slide option to add the Post/Page ID on your Slider. From this option you can set the Image Slider. 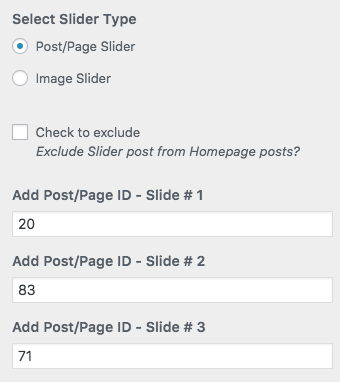 If you need more slide for slider just go back to Slider Settings where you can see Number of Slides option to enter the number that you need to slide then click on plubish button and refresh the page. 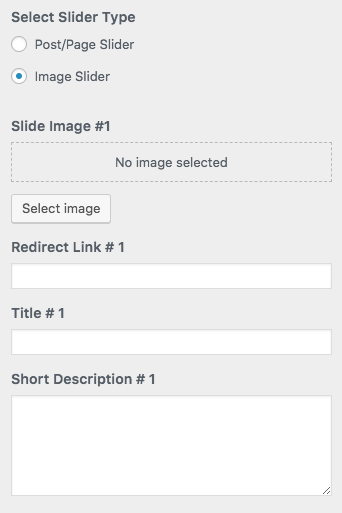 Now you can see more slide option to add into your Image Slider. From this options you can set the Social Profiles which is visiable in My Info section as well as in the Footer section. To set it go to Appearance > Customize > Social Proflies. Add the full link to your Social Profiles in the textarea field. Seperate each Social Profile link with comma. From this options you can set your Info which will be only visiable in Post (Blog) Layout. To set it go to Appearance > Customize > My Info. Add the Title, Description and Photo accordingly. If you have set the Social Profiles then you will see this option to hide it as well. To set it go to Appearance > Customize > Excerpt you will see the below options. From this options you can set the Scheme Color of the theme. To set it go to Appearance > Customize > Color > Scheme Color then you will see the same like below list of options. 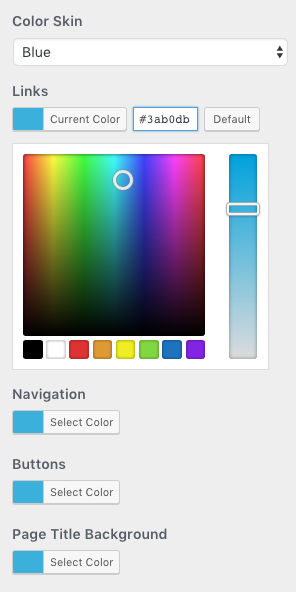 To set it go to Appearance > Customize > Color > Elements Color you will see the same like below list of options. To set it go to Appearance > Customize > Colors > Font Color you will see the same like below list of options. You can set Font Family from below options. From this option you can set font family for All Title and Headings/Titles and Content. To set it go to Appearance > Customize > Typography > Font Family you will see same like below options. Click on dropdown option to select between 700+ Google Fonts. You can set Font Size from below options. To set it go to Appearance > Customize > Typography > Font Size you will see the same like below list of options. 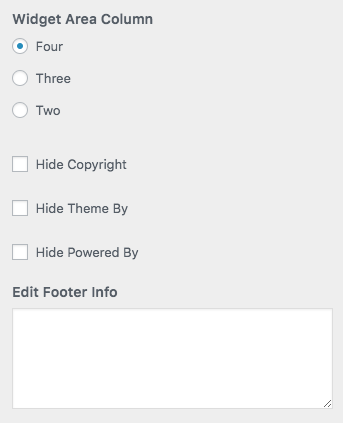 From this options you can Hide Social Profiles, Display Footer Info at center and set Footer Fluid. To set it go to Appearance > Customize > Footer. From this option you can hide the Social Profiles from the footer if you have set the Social Profiles then you will see this option to hide it. From this option you can align the footer content to the center. You can select Widget Column, Hide footer info’s as well as Edit whole Footer content.